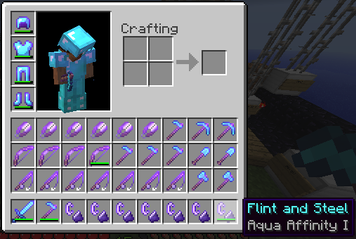 EnchantMore adds dozens of new item enchantment effects; on flint & steel, hoes, shears, fishing rods, and other items…Ranging from entertainingly destructive to legitimately useful. Download EnchantMore 2.0 - released 2013/04/19 for 1.5.1-R0. View the full effect list! Some effects are overpowered or unstable; be careful! For all known issues or to file a new bug see Tickets. All permissions are in this form: enchantmore.<category or item>.<enchantment>. Item names are identical to those in the default configuration file, for example enchantmore.flintandsteel.aquaaffinity. The method that forms the permissions can be found here on the GitHub source. Got a cool idea for a new effect? I can't promise I'll implement everything, but all suggestions are welcome! Feel free to discuss your ideas below, or open a ticket for more specific requests. Including the specific item + enchantment name is appreciated, preferably from the available wanted effects list. Also interested in new potions? Try PotionsPlus. A huge thank you to the following people for helping me get EnchantMore 2.0 tested and finished! Sorry about the wait. We have been working hard to update EnchantMore. It is in the final processes of updating and will be released in 1-3 days. Thank you for being patient. I would be nice to have a 1.7.2 build of this great plugin! iCon what you doin here? SHarpness enchant is a little broken on picks one redstone ore generated 4 stacks of redstone and one diamond block generated 9 diamonds fun for exploits but not fun on survival would you please look into this? Thank you for your time! is hre a way to stop it or a certain node i havn't tried already? Thanks for updating it never seen someone join that quick and update so fast! I have uploaded a updated version so enjoy when it gets released. I have this installed with McMmo, When i try any enchantment the requires right-clicking, it doesn't work, i think mcmmo's controls are interfering. is there a way around this? is this what the "smp mods" setting in the config is for? Dang it I really like this plugin. I hope someone takes it over soon.